If you're looking for a 4K gaming system, then Sony has gotten the jump on Microsoft and released its PS4 Pro ahead of the Xbox One X. It's an excellent system and definitely worth getting. 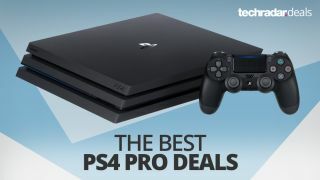 On this page, you'll find the best prices and deals on the PS4 Pro console and bundles, so scroll down for some awesome deals. If you still have any questions about the console itself, we've got the answers further down the page. If you're after a deal on an original PS4 or PS4 Slim, then head to our best PS4 prices in Singapore page. Need an extra controller on the cheap? Take a look at the best DualShock 4 deals. Despite not being a 'next-gen' console, the PS4 Pro is an upgrade of the PS4 and features the coveted 4K and HDR options that we're hearing so much about. This new console allows game developers to include 4K options in their games, so we can see the likes of Uncharted 4, Call of Duty: Infinite Warfare, Days Gone, Horizon: Zero Dawn and more in stunning 4K. HDR, or High Dynamic Range is the other buzzword to be excited about as the PS4 Pro will allow for extra detail to be seen on a range of games and also a wider range of colours not usually displayed by traditional HD TVs. Yes. Even though some games won't be patched to take advantage of the new 4K/HDR capabilities, all of your old games will still work. Not only that, but the default upscaling (if you have a 4K TV) will likely see some improvements to the visuals and the boosted console power may give a slight nudge to the frame rates for some smoother play. The PS4 Pro will be excellent as a streaming and media hub for your home theatre. There's also a lot of free 4K content on the YouTube app, and other streaming services are adopting 4K and HDR-ready content more and more. No, although the Xbox One S does. So if you're specifically after a 4K Blu-ray player then head over to the competition, but as many viewers are crossing over to streaming services for their digital viewing, this may prove a wise move from Sony in the long run. You definitely don't need a 4K TV, but we recommend it. The PS4 Pro will still run as per normal on a regular 1080p TV, although you won't get the benefits of upscaling or HDR. There's a chance you may see a frame-rate boost or a slim amount of extra detail, but we wouldn't expect a massive leap. Yes! Even though it's absent from the PS4 Slim, PS4 Pro owners will still be able to use optical connections for their soundbars and sound systems. After scrounging through our back catalogue of PS4 games that have received a Pro update patch, we've come up with the games that look the best and have a noticeable difference. Take a look at our extensive list - The best PS4 Pro games.